Playground, originally uploaded by Venus In Furs. Gibson has been showing more and more signs of his growing independence. For instance, while at the park this afternoon he really wanted to sit on this bench but couldn't get onto it himself, so he gestured and motioned for my help up. Then he clearly wanted me to go away and proudly sat and kicked and smiled and babbled to me. It's really wonderful to see. And, I won't lie, a bit exhausting. 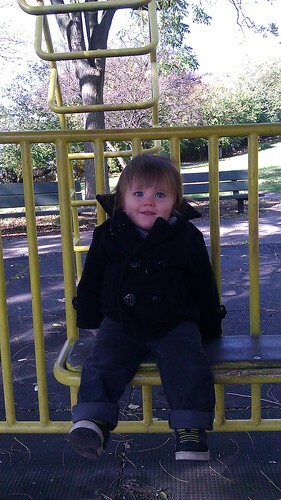 i love looking through your photos, and i cannot tell you how much i love little man clothes. people say girls are more fun to dress, but i DISAGREE COMPLETELY. tiny little man clothes are where it's at.